Amazing collection of traditional antiques and artwork. This two-storey luxury villa is located right at the shandy shore of Pointe aux Canonniers on the northern coast of Mauritius. Surrounded by nothing but nature, this villa is the perfect peaceful sanctuary to holiday away together with your loved ones. The centre of Grand Baie, where you can shop around, wine and dine and explore the colourful bazaar, is just a five minute drive away from the villa, giving you the best of both worlds. 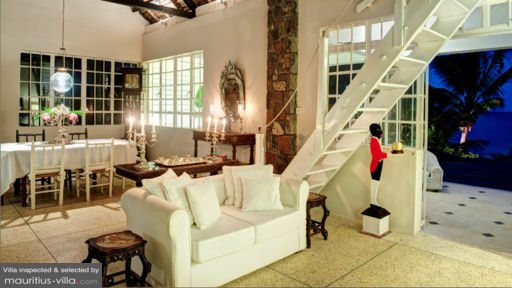 An cast-iron gate from the year 1888 leads into villa Maison Coloniale, a stunning traditional Mauritian home with a high soaring alang-alang roof and a classy interior design of chic white combined with beautiful antiques and an amazing art collection. This villa was built as a beach resort by a prominent figure of the island and these days it is still owned by his great great grand children. It really is one of the islands best kept secrets. In the peaceful tropical garden grow high swaying palms, ancient flame trees and other exotic greenery, stretching out all the way to a private stretch of white sandy beach where you can swim in the azure blue ocean and watch both sunrise and sunset that are equally breathtaking, leaving you with a feeling of enchantment. The stunning curvy swimming pool is encompassed by a timber deck where you can sunbathe on the pool-side loungers or enjoy drinks at the charming seating area. On one end of the pool there is a gazebo furnished with a day-bed for relaxing to the sound of the ocean and on the other side there is al alfresco dining bale with ocean view. The four air-conditioned bedroom suites feature deluxe king or queen-size beds, gorgeous teak furniture and private en-suite bathrooms. Some of the villa suites open up to the wonderful ocean view and another one has direct pool access. The villa has two maids doing all the housekeeping for you, six days a week. There is also a gardener and there is CCTV in front of the main gate. A in-villa chef or spa treatments can be arranged for you upon request.